Who doesn’t love candles? Here is a pretty Christmas gift that you could make by yourselves. If you have some old, leftover candles, you can turn them into beautiful presents for your loved ones. Let’s get ready. How to make scented candles? – Break candles into pieces and put them in a pot that you won’t use for cooking. – Make them melt on medium heat. – Add a couple of drops of aromatic oil into melted candle. – Mix with a spoon that you won’t use. – Attach one end of the wick on the bottom of the jar. Whip the other end to a pencil. Place the pencil on the jar. That way, you make the wick stand upright. 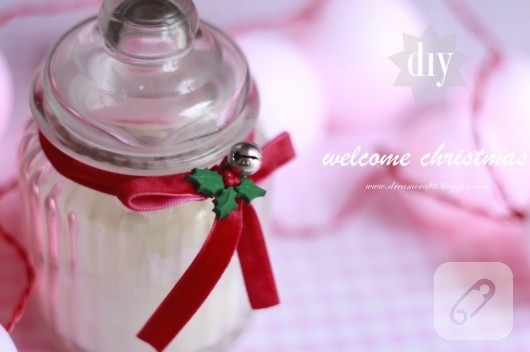 – Pour the melted candle into the jar and wait to be firm. Now, all you need is to decorate the jar. You may use a thin velvet ribbon, tiny green holly leaves which you can cut out of thin felt, and maybe tiny red beads. You may add a small bell.